This is the ninth of a series of blog posts entitled “Diary of a Song“, where I share the stories behind each of the songs from my latest album “Illumination“. 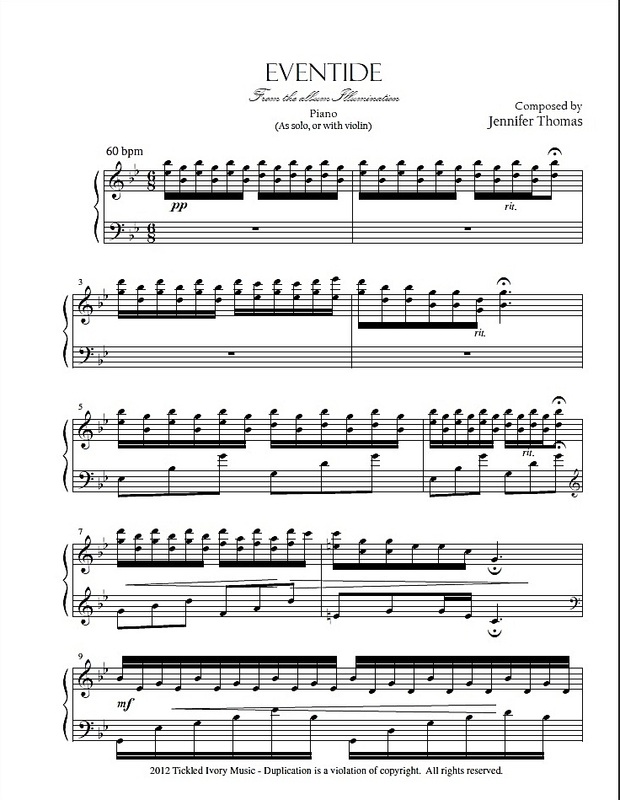 At the end of each post, I also include a link to buy the sheet music, and the MP3 download. Is it okay to have a favorite of my own compositions? Well if so, this would be it. “Eventide” is by far, hands down, my favorite song on my Illumination album. This was just one of those songs where the music flowed to my fingers and I really felt a spiritual connection to the music I was creating. I composed this song while we were living in a rental home that had this big window and my piano sat in the nook of it. Across the street there was an open field and so in the evenings, when it was dark, there were no trees to block a perfect view of the twinkling stars (if the sky was clear, that is). “Eventide” is another word for “evening”. And with the minor to major triad chords going on in the song (proven by science to create an emotional crying response from people), this song really pulls at my heart strings. I originally just wrote it as a solo piano piece, but then later as I worked on the orchestration for Illumination, I added strings and a boys choir to the song – which ended up having a sort of Danny Elfman-ish sound to it. Or, I’ve also been told it sounds like something James Newton Howard would have composed for a film. I had this piece completely finished and orchestrated, when one evening when I was driving in my car and listening to a rough mix of it, I started hearing and humming the theme from “Sheherazade” to it. 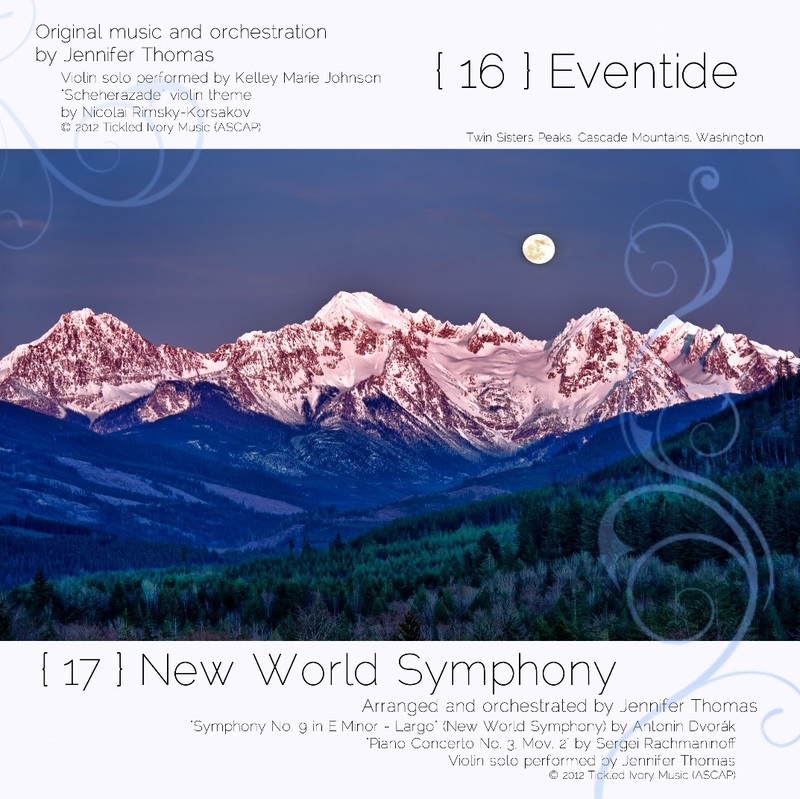 Sheherazade is an orchestral work composed by Nicolai Rimsky-Korsakov that I performed both in college with my university symphony, as well as the Oregon Pro Arte Chamber Orchestra a few years later. The solo violin part of the symphony represents the character of Sheherazade, whom in the story of “1001 Arabian Nights” (aka “Aladdin”, etc. ), is the Persian queen who saves herself from death by telling a story to her husband, the king, every night for 1,000 nights. As the story goes, the king would take a new wife and then sentence them to beheading the following day. Sheherazade volunteered to spend one night with the king – in which she ends up telling him an entrancing story which she does not finish. She only promises “I will tell you the rest of the story tomorrow night.” She keeps herself alive for 1000 nights by telling story, after story, after story…in the end, leads the king to fall in love with her and spares her life forever. The musical theme fit so well with the music, and also the night time essence of the song that I went back and wrote the solo violin part into the music. On my album, you can hear violinist Kelley Marie Johnson give an emotional performance of the song with me. You can BUY THE PHYSICAL ALBUM from me directly, or from Amazon or CDbaby. I will even autograph it for you! In my recent blog post about the score that I composed for the film “Minuet“, I mentioned that I would eventually get all of the cues posted so that you could listen to the score in it’s entirety. Well, then I got extremely busy, followed by having a baby, a week later followed by another week in the hospital due to Pancreatis and Pre-Eclampsia…and then finally a break from the craziness. For the past week and a half I’ve enjoyed being at home (instead of the hospital), I’ve enjoyed not busying myself with music projects and have just enjoyed my two adorable little boys. Alas, here I am though, albiet with a bit more peace of mind and a lot more energy to do things. Like post blogs. So without further adieu, I give you the original score (composed by Jennifer Thomas) to the short film “Minuet” by Ryan McNeal, soon to be debuting in film festivals this Fall. These tracks are unmastered, which is why I don’t feel bad about sharing the full files (otherwise I might have only done clips). Cairpre (Frank Heinrich) and his granddaughter Elise (Isabel Machado) live on a shore haunted by the ghost of the granddaughter’s mother (Leann Van Mol). Afraid of the waters that took his daughter, Cairpre keeps young Elise from the shore. But when she follows her mother’s voice down to the very shore that claimed her, Cairpre’s world is pitched on end. He stands to loose the only thing he has to love. Minuet is a short film intended for festival entry. It was filmed by a crew of 30 people over four days. The entire production took nine months. Read the diary behind the process of writing this score here. Well, it’s been a couple of months since I last wrote about the film score that I’ve been working on. Since I am in the final week of finishing it up, I thought I would do another post. By the way you can read “Diary of a Score: Part 1” here. Keep reading because I’ve included several clips of the new music from the film for your listening pleasure. Back in May, I started working on the original filmscore for a short film called “Minuet” by writer/director Ryan McNeal. (Short film, meaning 16 minutes in length). This was to be my first time writing a score completely from scratch, and so I wanted to journal about my perspective on the process while going through it for the first time. Perhaps it might help others who are venturing along this path, or hope to one day. Or just for those who are curious what goes into it. I am also 9 months pregnant right now, and so my urgency to get this project done is at a pretty high level right now. Since May I have completed 5 cues for the film (composed, recorded, synced, and mixed), and am working on the final 3. In Part 1, I wrote about two cues I had worked on and how I got the inspiration for the pieces, and how I acheived them. This time, I thought I would write about some of the challenges I’ve faced with film scoring, and then go into some of the new music that I’ve completed. While composing the music for this film score, I’ve also simultaneously been working on my next album (although, the album has definitely taken a back seat). I would say it’s been a few months since I last sat down and wrote new music for my album, and so recently I was itching to put the film music aside and work on my own music for a bit. I was needing something new and fresh to work on, and I just needed to get my head into a different style of music and let loose a bit. So one night, I sat down at the piano and was just playing around when I started coming up with a new song. It sounded pretty cool, I thought. So I started writing it down and adding to it. Before long, I had two and a half pages worth of music written and a great start to a new song. I wrote in the title “Possible song for album, come back to later”. Well the next day I came back to the piano and played through it and realized that the song I’d just started to write the night before had the same nuances, chord progressions, mood, and almost the same theme as the cue that I had just written for the film. Ugh, I was disappointed to realize that because I had been so involved in the music for the film, its influence was carrying over into my own personal work and sounding amazingly similar. I’ve never wanted to be one of those composers where all their songs sound the same, or that you can tell within 2 seconds who the composer is. I mean, yes, I find it flattering when people can recognize my music. I just don’t want all my music to sound the same. It’s a huge pet peeve of mine and I try my best to avoid it. So to realize my music was starting to sound the same…bugged me. That has been one of the challenges I was talking about. I have decided that I just won’t work on any of my own album music until after I finish this film score and get at least a couple of months of a break. I guess you could say I can now see why artists who release music back to back to back end up producing music that sounds very similar to their last work. I won’t name any names, but a very big named piano artist comes to mind. I’m sure you know him and probably love his music, but I say if you have one of his cds then you don’t need to buy anymore because they’re all the same. I just completed one of the longest cues of the film. It’s about 4 and 1/2 minutes in length. This was a particularly hard cue to write because of the range of emotions involved. The scene starts with Cairpre (the grandfather), waking up in the hallway outside of Elise’s room where he spent the night guarding her door to ensure she would not sneak off again. He wakes up realizing that it’s morning, peaks into her room and sees that she is gone. He searches around the house for her, and then his worst fear is confirmed as he realizes that she has gone down to the sea shore (where his daughter died). He runs outside and calls after her, trips, and falls. He passes out and experiences a flashback dream of when he discovered his daughter on the beach (his daughter died in the ocean, washed up on shore). The mood of the dream is danger, sadness, and regret. You see Cairpre look at the ocean accusingly as the murderer of his precious daughter. He then wakes up and realizes that the same fate may have happened to his granddaughter and begins to cry. At this moment, you see two figures approach him and he looks up to see Elise (his granddaughter) and his daughter, Claire (the ghost of her). Claire has returned Elise safely to Cairpre and then walks away. Cairpre and Elise hug and there is much joy in their hearts. At the beginning of the cue, when Cairpre wakes up, I wanted to portray a sense of urgency. As if a clock was ticking and the more time went by, the more danger Elise was in. So I started with the String Basses and Cellos doing a tick-tock sort of pizzacato beat as Cairpre is searching around the house for Elise. After Cairpre runs out of the house and down to the beach, he trips and falls and experiences a flashback dream. I wanted the music to completely change there so that the audience would know that he was having a flashback; that it wasn’t just a continuation of the scene. Since Cairpre’s theme throughout this film has always been the solo piano, I thought it would only be fitting for his flashback dream to start out with the piano. Up until this point in the cue, there is no piano involved. This was done on purpose so that the piano would specifically identify with Cairpre for the flashback scene. As Cairpre lingers down to the beach and finds his daughter lying amongst the rocks, he is filled with distraught, anger, and sadness. He looks up accusingly at the ocean. At this point you see waves crashing against the rocks and the dispair on Cairpre’s face. Since there is no dialogue in this scene, the audience has to be able to understand what is going through Cairpre’s mind through two things – his expressions (look in his eyes), and also the music. I wanted to show his anger towards the ocean at this point, and so the music builds here. You hear the “tick tock” pizzacato theme come back into play because, obviously, time is not something he has anymore. Yet he wants to save his daughter, and knows that he cannot. It is too late. He is angry, and sad. I chose to really amp up the piano part here (again, representing Cairpre) and so the music intensifies with some strong bass piano notes. I also wanted to sync the music to the waves crashing against the rocks. I discovered that cymbal swells create an amazing likeness to water splashes. And then on top, I added in some marcato (short bowed) violins and cellos that sound very, how would you say…nautical, I suppose. Very “Pirates of the Carribean-ish”, I suppose. I wanted to portray an ocean theme there, and the marcato strings really do create a feeling of command from the sea. Oh, and I almost forgot, I added in some brass (French Horns) because they are able to give a very big full sound to the mix. They can also be changed from a soft timbre to a very brassy one when needed (as you’ll hear when the music intensifies). You will also notice, after the intense part of the music happens, it returns to the solo piano again. But this time the solo piano is playing the “tick tock” beat, as if to signify that Cairpre now has to live out the remaining time of his life alone. All right, so after this Cairpre awakens from his flashback dream and sits up, realizing that he is still in the here-and-now, alone, and now possibly has lost his granddaughter as well. The emotions here are sadness and despair. However, just moments after this we see Elise returned safely by the hands of her mother’s spirit. The feeling here is that Cairpre is indeed not alone because he has his granddaughter. He hugs her and cries, and realizes that perhaps all along he had been concentrating so much on the death of his daughter that he didn’t realize what a special opportunity he still had – to live and raise his granddaughter. He is overcome with joy. All right, at this point in the music, I had to breathe a sigh of relief because it is the first time in the film that I was able to inclue some major keyed “happy” music. Which, coming from me, if you know anything about my music and my style you know that I love, love, love minor keyed music. However, I have to say that after composing very eery minor keyed music for a couple of months, I was pretty stoked about writing something that involved a sense of joy in the music. I really felt like this scene was pivotal for the movie. This was the scene that tied everything together, and explained it all. Again, having very little dialogue to go off of, the audience needed some help and persuasion from the music to really feel those emotions happening on the screen. Out of all the cues for the film, I felt this was the most important. When I was in college, one of my professors taught me about a certain chord progression that involves going from a major 3rd up to it’s minor, uh, I want to say interval but my brain is spacing me right now. For example: Play the notes C, E, and G on the piano (a C major triad). Then play an E minor triad – which would be an E, G, and B. Well studies have shown that when this type of chord interval is used in music, it has actually created an emotional response in people, causing them to cry. I’m not joking whatsoever. If you can actually google this and find the source of the study and email it to me, I’ll send you a free cd. So, anyway, I used this chord progression (give or take a few variations in structure) for the scene when Claire returns Elise to Cairpre. I also added the vocal theme back into this spot in the music, since Claire’s theme throughout this film has been the angelic voice. My good (and very uber talented) friend Poppi London provided the vocals for this cue (and another cue involving Claire, earlier on in the film). Anyway. So that is basically it for that clip. (Eventually when all is finished, I’ll be posting all the music from the film so you can hear it in its entirety). I said in my previous “Diary of a Score” post, that I would let you hear the beginning theme to the movie. This is the music that comes on during the first shot of the film, as Cairpre is narrating. It is meant to sound eery, mysterious, but also beautiful. Cairpre introduces us to the reasons why the sea haunts him, and then we see him walk past an old record player and on his way up to his bedroom to retire for the night. As he is holding a candle, we see a crayon drawing of a picture of “Grandpa, Mom, and Me”, obviously drawn by a child. As he says the words “Now when I look (at the sea), all I see is death)”, a black screen comes on and then we see the title screen for the film “Minuet”. As I said earlier, I have given Cairpre the voice of the solo piano in this film. So as he is narrating why he is sad, and why death haunts him, you hear this eery almost dance-like solo piano music at the same time. The solo piano theme always represents Cairpre’s lonliness in this film (except at the very end, when it represents his joy). As the black title screen comes on, the music intensifies. To give the music an eery sound to it, I used two violin techniques. It is a mixture of harmonics and using the bow underneath the bridge (a very airy scratchy sound). Obviously the two can’t be acheived at the same time, so there are two violin parts going on there – each accomplishing one of those. I also added a bassoon (which you can only hear if you are listening very very carefully) as it added to the creepiness of the music (reminded me of some of Stravinsky’s “Petrushka” ballet). So I think that about ends this novel of a post. I hope you enjoyed hearing some of the details of the score and would love any comments or feedback! Ciao! P.S. Just a reminder, as posted in my last blog, I’m having a sale on Key of Sea for the month of July. See previous post for details. 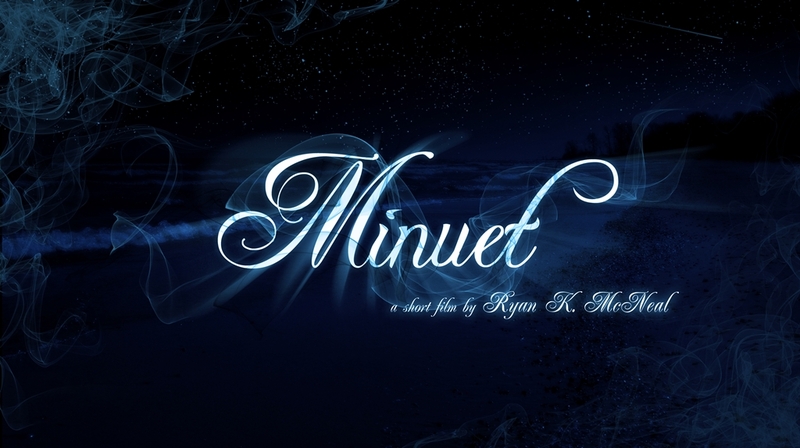 Many people have been asking me how the film score is coming that I am composing for Ryan McNeal’s short film “Minuet“. I thought I would post a little bit it about what I’ve done so far, and my process through it all. So far I have watched the rough cut of a film about 5 or 6 times. This cut has the temp music on it. It’s been good to hear what type of music Ryan chose to put in there, but I didn’t want to watch it too many times fearing that my mind would subconsiously learn that that is how it should be. I recently was able to obtain a cut of the film without any music, which I uploaded into my sequencing software, Sonar Producer 8, and I’ve have viewed this version at least 20 times, with many more viewing sessions to come. Last week, I went through the film in detail and wrote down any moment where I felt that music was needed (not thinking about the temp music, but just what I felt was needed for the scene). This included writing down specific timestamps on the film for later reference. 00:06:31:22 – Cairpre is on deck and see stuffed animal on beach trail from afar. Need cue to let audience know he sees something. 00:06:34:01 – Goes down the stairs in a hurry, start building intensity in the music but not too much yet. 00:06:52:07 – Starts running, yelling “Elise!”. Music should be fast, intense as he runs. 00:06:58:04 – Elise is standing on beach, there is a sense of danger. Audience needs to feel through the music that she is in danger. 00:07:07:05 – Cairpre runs up to Else and grabs her, she jumps. Music starts to die down. 00:07:18:10 – Claire’s vocal theme starts as Cairpre looks up and around at the beach. Haunting, beautiful music. As you can see, writing down what goes on in the scene at what times creates a map for me for when I compose the music. I will know, for example, that from this time to that time, there needs to be 9 seconds of intense music. Then the next 14 seconds need to dying down and gradually fading out. With the above notes, I then watched the scene several more times to figure out what I heard in my head as far as the music. Since the scene starts with Caipre waking up from a dream and then going out onto his deck, I knew that I wanted the music to portray his sense of lonliness and despair since he lost his daughter. The solo piano represents this. When he sees his granddaughter’s stuffed bunny on the beach, it signals to him that she had snuck out during the night and was somewhere on the beach. So I then started to melt the solo piano into some strings, where the harmonies were tight and intense but not too much yet, because I wanted to save that for a moment happening only several seconds later. As he picks up the bunny and starts running towards the beach, the music picks up in speed and intensity. I brought in some very short bowed notes on the violins, some longer strings lines from the rest of the orchestra, and some timpani beats and cymbal swells to add to the intensity. Getting the music to sync exactly with the timing of the scene was difficult, because the “intense” theme I started to develop ended up being too long. I went back and rewrote the section, then adding a key change which shifted the intensity up a notch as well. Then, as Cairpre looks up to see the ghost of his daughter on the beach, the music needed a change there. I felt that the beautiful spirit of Claire needed to be represented by a haunting vocal line. So as Cairpre looks up to see her standing on the beach from afar, you hear a beautiful voice overlaying the strings and piano (which, by the way, the vocals you here on the sample below are just temporary and created using software. They will eventually be replaced by a live voice from a real soprano). Now, to hear how this all came together, here is the sample of what I came up with. You can just click on the link and an mp3 will come up momentarily. The hard part about composing for film, is you might spend a lot of time composing a cue and the director ends up not liking it, or it doesn’t fit the scene. What you might be hearing in your head may or may not be what the director hears in his/her head for that particular scene. Ryan loved this cue, however, once they got it synced up to the film, he wasn’t sure that the timing of the climax of the scene matched the timing of the climax of the music. It is very true that the music can change a scene entirely and it’s got to be timed exactly. For those who are fans of M. Night Shyamalan films, do you think you would be as greatly affected by the film if the music didn’t have certain cues in it to stir those emotions within you? For example, in the movie “The Village”, you do not see any danger in the movie until the final moments of the film and yet you are greatly affected emotionally by certain musical and audio cues from the very beginning. Another cue that I recently worked on, was a scene for where Caipre has a flashback dream. The cue starts with the tail-end of a scene where Cairpre says goodnight to his granddaughter and closes her bedroom door. She blows out a candle, the screen goes black. Next you see some ocean waves hitting some rocks on the seashore, and then moves to show Caipre in bed sleeping, apparently experiencing a dream or nightmare. You then see him have a flashback dream of the moment he found his daughter dead on the beach. Waves are crashing all around, he looks very much alone and saddened, and full of dispair. Then, he wakes up suddenly and sits up in bed. My idea for the music for this scene was to show how haunted Cairpre still is by the passing of his daughter. My idea was to have the music play in reverse for the flashback. It sounds misconstrued and nonsensical, which is how dreams are most of the time. And then the music comes to a complete stop as Cairpre suddenly wakes up. This was a bit tricky to execute and I tried several different ways to do this. First I recorded a very basic string section part with some minimal harmonies. I then took that part and reversed it. This didn’t end up working, because apparently when you reverse string parts they sound exactly the same backwards. Which, makes sense. When a bow hits the string it attacks the instrument the same way no matter if it is coming or going. Whereas, with a piano, the notes are struck with a hammer, thus making the reverse effect much more noticable. If you think of a piano note being struck and then slowly fading out. If you reverse that, you would get a note that slowly fades in and then ends with a striking. So I then added a piano part, which knowing it was going to be played in reverse, did not need to make sense or be melodic. In fact, I added some very off-key notes in there just to see how it would sound. Upon reversing it, and lining it up with the strings it actually worked quite well. With the striking of the piano strings, it also created somewhat of a rhythmic pounding nature to the sequence, which I wouldn’t have acheived otherwise with just strings. I also added some pizzacato notes in the strings for the reverse section as well, which again, you don’t really pick up but you would notice them gone if they were taken out. At least my ears do. I have one other cue that I’ve finished so far and it is the music for the intro to the film. But I’ll save that to share at some other time. So far, out of the 9 cues that I counted up that I will need to compose, I have completed these 3. However, like I said, due to film editing and sequencing, I can’t say these cues are final until they actually cut a final cut of the film. 6 more cues to write. The film is in line to hopefully be finished by the beginning of September. However I am due to have a baby around the middle of August and so it’s my goal to finish the music for the film by the middle of July if not sooner. And that’s a rap for this post. More to come at a later time. Read “Diary of a Score: Part 2” here. I just uploaded my latest project, “Toccata and Fugue“, as it is called right now. I just wanted to share a little bit about this song and how it came about. First, for those who just listened to my ‘Lullaby Album’, you should know this piece is of a completely different callibur or style. If you have a sub-woofer on your computer speaker system, you may want to turn it down a bit because the song has a lot of bass to it. It’s quite “boomy”. I love, love, love Classical music. And I especially love to tweak it. Which results in much of my music being of a “Classical Crossover” genre in nature. “Toccata and Fugue” is based off of J.S. Bach’s Toccata and Fugue in D Minor, BWV 565. (Bach wrote 2 Toccata and Fugues in Dm, but the one I am referring to is BWV 565). This piece is a very well known organ solo, and over the years it has traditionally been used around Halloween time because of it’s thematic elements and somewhat frightening minor chords that can rumble an entire concert hall. I have been quite familiar with this piece for several years as my college symphony orchestra performed it for a Halloween concert one year. It is one of those pieces that gets into your head and kind of haunts you. About a year ago, I was in my home music studio and started fiddling around with this piece on my keyboard. I started adding more instrumentals to it and came up with a very cool 1 minute clip of some ideas. Well, and then, the piece got brushed aside as the muse left, and I didn’t work on it again for a long time. About two months ago, I decided that I really wanted to finish my rendition of this song. So I opened up the file that I started over a year ago and listened to it. Then I sat down at my piano and started writing parts out. As with a lot of pieces that I write, I started going off on some solo-esque cadenzas on the piano (in other words, tangents) and made the piece completely un-listenable to anyone but myself. Well, because I really enjoy Classical music for that very reason. You can do things like that. However, that is also why a lot of people today find it hard to follow Classical music and understand it. So I re-worked this song and reworked it to make it appeal to a broader audience. I think I ended up with 7 or 8 different drafts. Each time, refining it, simplifying it, and structuring it. In the end, I ended up with a song that is about 30% Bach, and 70% Jennifer Thomas. You will hear what I mean in a second once you hit the play button. I was fortunate to work with a couple of great musicians on this piece. Glen Gabriel from Sweden formulated most of the beats and effects, and Adam Amos of the UK also did some of the beats and effects. Zak Dewey of Seattle did the mixing and mastering, and I did everything else – the piano, orchestration, and the kitchen sink. Thanks for taking the time to listen to my late project – hope it doesn’t disappoint. And for reals, turn down that subwoofer. Don’t say I didn’t warn you. You may have heard me vaguely mention my next album idea Portraits here and there. I am officially announcing it’s existence, and that I am going to be working on this project for the next year, with a tentative release sometime towards the end of 2010. I come from a family of passionate artists. Not just in music, but also in art. My dad, Ron Southworth, is a talented photographer. Over the past several years, he and my mom have taken countless trips to various parts of the Northwest to take photos of the beautiful landscape. It started out as just a hobby, and has turned into a side career for him as his photographs have developed a small fanbase (a.k.a. pieces of fine art that sell between $250 – $500 per print). He is also a member of the Camano Island Art Guild, which is neat because the island has been a flocking spot for artists for years and you have to be invited to be a member, after in depth screening of your work. The thing that makes his photography unique is that what you see is what he truly saw through his lense. In a world of digital art, Photoshop, and other ways to manipulate photos these days, my dad’s art stands unique in that he rarely, if ever, uses such manipulation in his photos. The skies are that beautiful pink color because he knows how to use his camera equipment to capture it. The colors are that vibrant for the same reason. So back to Portraits, having seen the beautiful pieces of art that my Dad had been creating over the past few years sparked an idea in my head about a year ago. I had been toying around with the idea of doing an album that was story-based. Meaning, I wanted to find an original story and score it with music. However, as I continued to research stories and ideas, I kept coming back to these photos of my dad’s. They were a story in themselves; an artistic journey around the Northwest landscape. I got out my little notebook (my brainstorming book), and jotted down several locations and iconic images of Washington (and some of Oregon). For example, lighthouses, beaches, mountains, waterfalls, cities, etc. I started to take one idea at a time and think of what would it sound like if it were music? In a sense, I suppose you could say that I started to score a soundtrack for each of the images/locations. And this is where the idea began for Portraits. My dad is on board with the project and will be continuing to capture images to be used for the music. This will be a more expensive project than I have ever done before though. For one, the time and travel involved. Two, because visual stimulation is key here (equal to the audio stimulation), I want to create a very moving and complimentary CD booklet with full color pages of each of the photography works. We are also thinking of doing an companion book of my dad’s photography, possibly a coffee table book. Thirdly, because the music for this project is going to be of a cinematic quality. Oh the ideas that I have for this. 🙂 I am going to be on the lookout for talent to collaborate with me on beat work; someone who is a wiz at producing beats of the down-tempo quality (think Enigma, Delerium, Paul Schwartz, etc.). So there you have it. The ideas and story behind my upcoming album Portraits. I am still in full marketing/promoting mode for The Lullaby Album right now, but since the production stage of that album is finished I can at least begin composing/producing the music for Portraits while simultaneously promoting the lullabies. I do have my husband and little one though, who are my first priority. So the music for Portraits will be written with no deadlines or pressure. This project is a pleasure for me and I feel that I really want to give it my utmost quality and talent. In other words, it will be done when it is done – without compromising family time or quality of music. How can YOU help? By simply helping me spread the word about my music. Help me get the word out. I have video promos on youtube that you can post on your blogs. Give my cds Key of Sea and The Lullaby Album as gifts for Christmas this year. 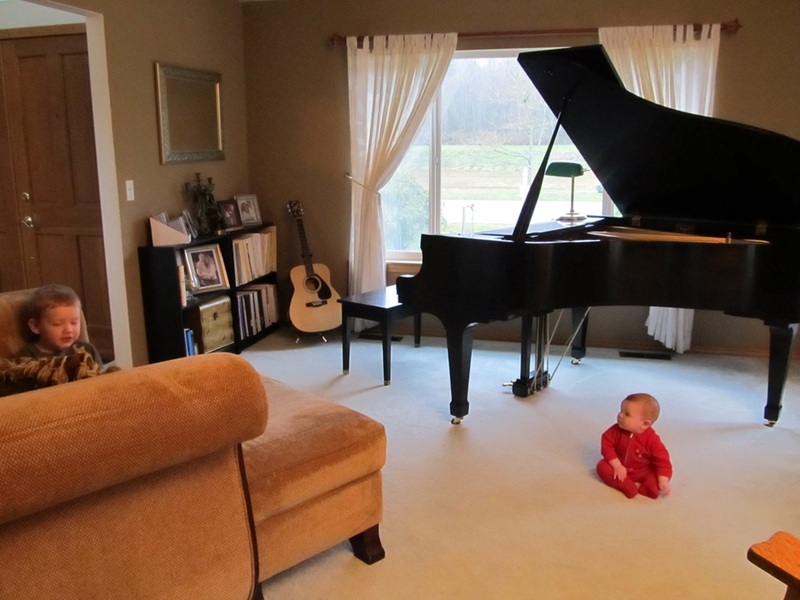 Come babysit Preston for me so I can work on my music. Please visit www.RonSouthworth.com to see more of this beautiful photography. Will people like the music? Am I prepared to accept that there will be negative responses as well as positive? Will my fans like this album as much as the last? Will it live up to their expectations? A friend once told me that “once an artist releases their work to the rest of the world, it is no longer theirs, but the world’s”. As much as I dislike that philosophy, it really does ring true. I’m always amazed to find my music popping up on new websites that I did not put there myself, or to find the hundreds of comments left on Pandora about my music, or discussions on blogs about my music. It’s almost like I’m just a fly on the wall. Do these people even know that I stumbled across their words or not? Most likely – no. The music is now the world’s to enjoy or critique, to love or dislike. So now as we are approaching the release of The Lullaby Album, I find myself savoring these last few weeks as the music is mine (and my mom’s) alone. It is solely our own creation and so personal… before it is no longer ours anymore and is birthed to the world. I find it ironic how these last few weeks feel just like the end of pregnancy (considering that this is a lullaby album). You are so anxious to have it overwith after a long creation period and lots of hard work, you want to meet the baby, but at the same time you savor that last little bit of time as you know the work really begins after the baby is born. Here’s to the final weeks.